For the Universal Windows Direct family, it was different kind of Sunday. The agenda had been set for a long time. Most of us didn't get to relax, nor did we get to shop or get yard work done. Rather, this Sunday came as the culmination of six months of hard work, day in and day out. For Mike and Bill, the founders of Universal Windows Direct, this past Sunday marked the attainment of a company milestone, 15-years in the making. 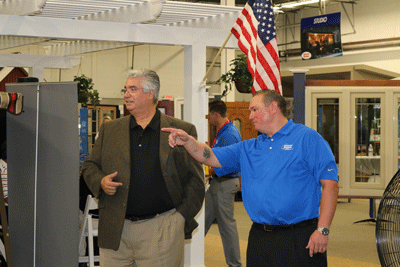 As of this past Sunday, the little home improvement company that was born in a tiny, 350 square foot office in Fairview Park, OH has added a brand-new, state-of-the-art showroom to its list of 30-plus locations across the country. The 90002 ft. showroom boasts endless showcases of our exclusive UniShield Windows, complete line of exclusive TEMO sunrooms and pergolas, as well as vinyl siding, doors and gutter protection. Not only are our products available for you to experience in person, but they're actually completely furnished with a fully-functioning hot tub, pool table, patio furniture, a grill; the whole nine-yards. It's like they're already in your own backyard! Sound nice? Nino Vitale, Founder and CEO of TEMO Sunrooms sure thought so. Upon seeing what we'd done with his products, he said, "This is magnificent, it's nicer than our own showroom. After seeing this, we need to make some improvements to how we do things at our place". 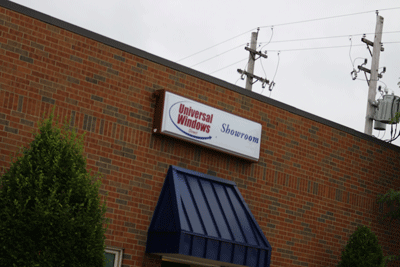 Nino, along with over 400 other attendees were the first to experience the comforts of the Universal Windows Direct showroom. The day began with a live broadcast from ESPN 850 AM WKNR, and included appearances from former Cleveland Browns players, Kevin Mack and Hanford Dickson, as well CHOMPS and the Bone Lady! "Sweet! ", The Mobile Cupcakery, The Fire Truck Pizza Company and Proper Pig BBQ were on hand too, providing delectable treats for guests to enjoy. 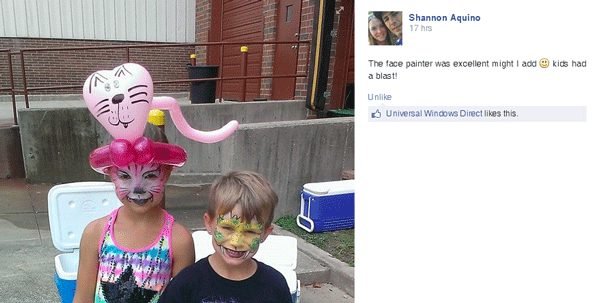 While moms and dads were inside, their children were outside, lined up to get their faces painted or waiting for cool balloon creation. "I think it's safe to say that a good time was had by all", said Bill, one of the company's founders. We would have to agree, judging by some of the feedback we got on social media. Interested in seeing the showroom for yourself? Come-on by, we're open from 9am to 8pm, Monday through Friday and from 9am to 4pm on Saturday and Sunday.